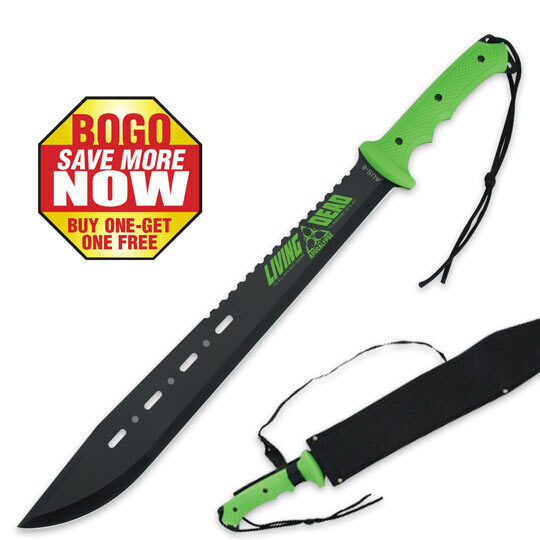 Black Legion Living Dead Machete Toxic Green Handle & Sheath 2 for 1 | BUDK.com - Knives & Swords At The Lowest Prices! Get ready to take on the undead with this brand new Black Legion Living Dead machete! The razor sharp blade features cut-out designs, heavy sawback serrations, and a durable baked-on black finish. You will receive two of these machetes with your order. BV123. I've had this machete for just over a year and it is still in great shape. The sheath isn't great but it works. I've been outside hacking at trees and tree stumps and the blade hasn't dulled much. I'd say this machete is zombie slaying ready. These things are pretty big and great for hacking. The only dilemma is the handle. The finger grooves are too big for my hand.